We’ve compiled a list of our favorite must-do Western Montana activities, like places to visit on and off the beaten path, can’t-miss attractions and fun things to do in and around Glacier National Park. Heads up…you’re not going to be able to fit all of these into one trip, so plan on coming back again real soon. Rent a bike in Missoula and explore the city's many biking trails. Sleep under the big blue sky—and maybe catch a glimpse of the northern lights—at one of Western Montana's many campgrounds. Visit Missoula's Rocky Mountain Elk Foundation and learn about the role the foundation plays in elk conservation. Pick your own sweet cherries from an orchard in Montana's Flathead Valley. Ski down the backside of Whitefish Mountain Resort. You'll feel like you have the mountain to yourself. Plus, the views of Glacier National Park are breathtaking. Try fat biking through the snow in our wintry wonderland. Marvel in the 58 hand-painted murals adorning the walls and ceiling of the St. Ignatius Mission. Experience the arts by catching a play at the Bigfork Summer Playhouse. Cast your line into one of Western Montana's blue-ribbon trout streams. Experience American Indian culture by spending the night in a tipi. Admire the spectacular views from Kerr Dam. The dam is a short drive from Polson and is 54 feet higher than Niagara Falls. Visit the unique habitat of the Ninepipe National Wildlife Refuge. Follow it up with a visit to Ninepipes Museum of Early Montana. Of all the ways to relax in Montana, soaking in a hot spring is at the very top of the list. Find the perfect souvenir at one of Glacier Country's many antique stores. Montana is home to many species of wildlife—keep your eyes open and your camera ready. Rediscover your inner child by sledding down the snowy hills of Glacier Country. Try stand-up paddleboarding on one of Montana’s pristine lakes. Visit the Glacier Institute for a hands-on educational adventure. Meet Montana's heroes at the Smokejumper Visitor Center. Hit fresh powder at one of Glacier Country's six full-service ski areas. Rent a canoe or kayak and paddle the Clearwater Canoe Trail near Seeley Lake. Plan a rock climbing trip with an experienced guide. Check out the mysterious vortex along Highway 2 near Columbia Falls. Join Missoulians for lunch and live music at Caras Park every Wednesday from June – August. Hike in the Bob (aka the Bob Marshall Wilderness). Rent wave runners and head to a nearby lake. Stop by a local chamber or visitor information center and ask about historical walking tour information. Hop aboard a hot air balloon in Kalispell for a once-in-a-lifetime ride and amazing views. Experience a Montana tradition and channel your inner cowboy at a local small-town rodeo. Take in a skijoring competition (skiing behind a horse) in Whitefish. Mine for sapphires near Philipsburg. Complete your day with a visit to The Sweet Palace. Spend the night in a forest service lookout. Take advantage of the region's noteworthy snowfall and go snowshoeing. Spend the night in a cozy cabin. Experience an American Indian pow wow. Catch a live concert on the banks of the Blackfoot River. Rent a motorcycle and cruise the roads and byways of Western Montana. Kayak the man-made Brennan's Wave on the Clark Fork in downtown Missoula. Montana has expert guides for world-class adventures. Take a guided trip, with options ranging from llama trekking to whitewater rafting and fishing to horseback trail rides. Take your boat and fishing pole to Painted Rocks Reservoir near Darby in the Bitterroot Valley. Race go carts on Highway 2 in Coram. Admire our wildflowers: Indian paintbrush, bitterroot and beargrass (to name a few). Bike through 11 tunnels and over nine steel trestles along the Hiawatha Rail Trail. Meet a great horned owl at the National Lee Metcalf Wildlife Refuge, a birder's paradise. Cool off at a water park or splash pad in Columbia Falls or Missoula. Watch bison and stunning views at the National Bison Range in Moiese. Check out the view of Kootenai Falls (near Libby and Troy) from the swinging bridge. Take a dip in one of our pristine lakes. Relax and enjoy the beautiful scenery along the Going-to-the-Sun Road on a historic red bus tour. Enjoy a game of folf at a local disc-golfing course. Take a gondola ride at Whitefish Mountain Resort and enjoy the spectacular surrounding views. The eclectic shops, funky boutiques, art galleries, book shops, second-hand stores, gift shops and old-fashioned candy stores that line our community main streets are a big part of our small-town charm. Savor an award-winning Montana beer at one of our local breweries. Watch the sunrise at Chief Mountain. You'll call it a perfect day even if you see nothing else. Stop by and say hi to the friendly volunteers at the Ronan Visitor Center. They'll probably give you pie. Watch an epic wildlife film at the International Wildlife Film Festival. Ride the hand-carved carousel in Missoula. Experience the Old West again on a wagon train or cattle drive. Rent a sailboat and set sail on scenic Flathead Lake, the largest freshwater lake west of the Mississippi River. Stroll a downtown art walk in one of our charming small towns. Grab a meal lakeside and watch the sun go down in Woods Bay. Go rafting (with a guide) on the Alberton Gorge. Take a look back at the history of Glacial Lake Missoula and the Ice Age floods. Learn about Glacier National Park from an American Indian perspective with Sun Tours. Cozy up to your sweetie on a winter sleigh ride. Fill up on wild huckleberries or morel mushrooms at a local farmers market. Explore a reminder of the past men and women who made a living working the mountains and streams here. Participate in North American Indian Days—one of the largest gatherings of United States and Canadian tribes—and celebrate the American Indian Culture. Swing your clubs against the backdrop of stunning views at one of our golf courses. Pick up some homemade rolls or fresh produce at a local Hutterite colony near Cut Bank. Experience Broadway in Montana at a performance from the Alpine Theatre Project in Whitefish. Stop at the local bakery in Ravalli for one of the best doughnuts in the West. 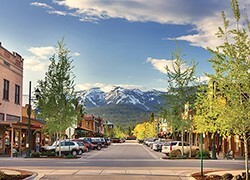 Kick up your heels and enjoy the nightlife in downtown Whitefish. Attend a local county fair or festival. Visit the Garden of One Thousand Buddhas in Arlee. Visit the St. Mary's Mission in Stevensville. Keep history alive with a stroll through the Tobacco Valley Historical Village in Eureka—a collection of restored buildings and structures from the 1880s to 1920s. Explore the interpretive trails at Savenac Nursery, a National Historic Site in Haugan. Fly through the air on the zip lines at Whitefish Mountain Resort. Drive or cycle the Lake Koocanusa Scenic Byway. Celebrate Montana's much-loved purple berry at The Huckleberry Festival in Trout Creek. Taste the spirit of Montana at a local distillery. Bask in the blues at the Riverfront Blues Festival in Libby. Drive or pedal the famous Going-to-the-Sun Road in Glacier National Park. Take to the streets for Winterfest in Whitefish. View a collection of scarecrows at Stevensville's annual Scarecrow Festival. Enjoy a delicious dinner and stunning views at the Belton Chalet in West Glacier. Stretch your legs on the boardwalk at Logan Pass in Glacier National Park. Hike the M on Mount Sentinel overlooking Missoula. Do yoga on the shores of Flathead Lake. Ride Amtrak's Empire Builder from East Glacier to Whitefish. Plan a girls' getaway and indulge in some Montana-themed spa treatments. Treat yourself to a uniquely-flavored ice cream at Sweet Peaks. Catch a show at the Wilma Theater in Missoula. Stop and pose with a hefty Hereford along Highway 200 at Clearwater Junction. Drive the Looking Glass Highway (Hwy 49) along the eastern edge of Glacier National Park for incredible views of the park and the Blackfeet Indian Reservation. These protected natural wonders feature glacial-carved terrain, sparkling waters and a unique cultural history, and serve as monuments of our dedication to the preservation of our vast and beautiful wild places. Live like a local and wander around any of our charming, funky, welcoming downtowns. Drive up to Polebridge and enjoy a baked good at the famous mercantile. Cross-country ski or snowshoe along the Going-to-the-Sun Road in Glacier National Park. Take in the golden colors of our fall foliage. Try a drive along the southern border of Glacier National Park, through the Seeley-Swan Valley or down the Bitterroot Valley.